This ceremony, by which a boy enters the Covenant of Israel, goes back to Abraham, who, through circumcision, made a covenant with G-d, where he vowed to teach his descendents to serve G-d with devotion. In return, G-d promised to safeguard the Jewish people. Today, by performing the act of circumcision, Jews perpetuate the covenant and make their children a part of that eternal promise. The procedure is performed by a mohel, who has mastered the Jewish laws regarding circumcision and received extensive training. At a Brit, the mohel removes the baby's foreskin and draws some blood, after which the baby is given his Jewish name. The naming of a Jewish child is considered a most profound spiritual moment, for at the beginning of life we give a name and at the end of life a "good name" is all we take with us. In Hebrew a name reveals essential characteristics. It is important to choose a name that will have a positive effect, since every time it is used the person is reminded of its meaning. When naming a Jewish baby it is a statement of what we hope the child will become and recognition of the child's heritage. Many people name their child after relatives or may choose a name based on the Jewish holiday coinciding with the birth. A girl's name is officially given in synagogue shortly after the birth when the father is called up to the Torah. 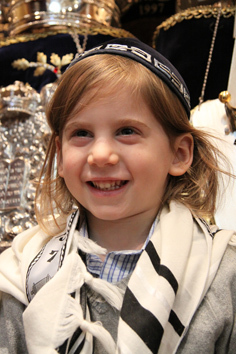 Jews often wait until a boy's third birthday before giving him his first haircut. This is called "Upsherin" - a Yiddish word that means "cutting off." Why three years? This is related to the mitzvah of Orlah. The Torah says if you plant a tree, all fruits which grow during the first three years are "orlah" - off-limits. Just as Orlah fruit is untouched so too we leave a child's hair uncut for the first three years. A tree needs the four basic elements in order to survive - soil, water, air, and fire (sun), children require the same basic elements as trees and need to be firmly rooted. For the haircut itself, it is customary for friends and family to take a snip. The first cut is done at the front of the head, where the boy will later place his Tefillin upon becoming Barmitzvah. After snipping, people give the boy a blessing for success.